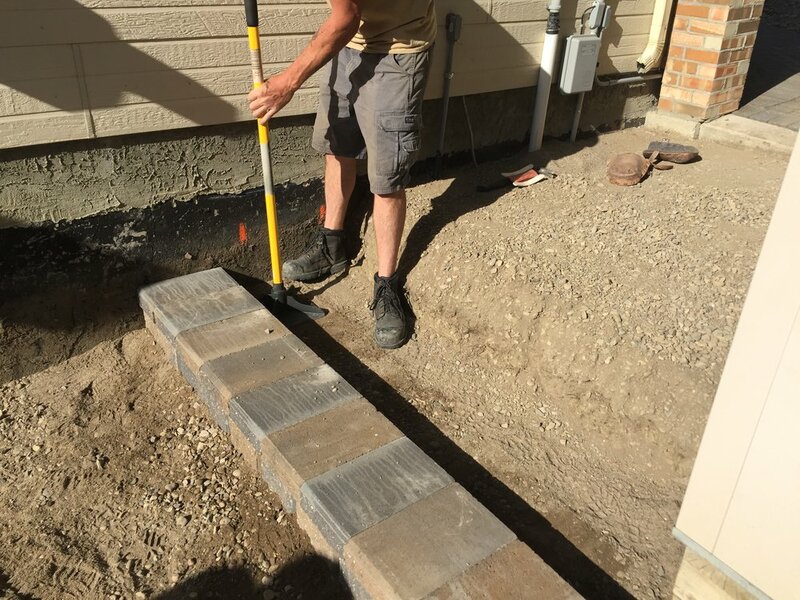 How to Install Steps With Retaining Wall Blocks — Hilgersom Inc. Adding steps to a garden or backyard is a great alternative to sloping paths. The nice part? You can install them yourself! Follow this step-by-step guide to create steps with segmental retaining wall (SRW) blocks yourself. Prior to starting the process of building your steps, you have to decide the shape you’re wanting, as well as the elevation of each step. Typically, you would want to try staying within a 6-7” rise for a comfortable step. Once you have that figured out, you can move onto preparing your base. A well-prepared base is essential for steps that look great for years. To prepare your base, you’ll want to dig a trench. The trench will be slightly wider than the block you chose and about 6-8” deeper than the bottom of the block. Keep in mind that at least 2-3” of the bottom of the SRW block should be buried to prevent it from shifting forward. After the subgrade of the trench is packed, ¾” road crush (base gravel) can be added, leveled, and packed. This step may be repeated more than once to ensure that the gravel base if both level and packed. Keep in mind that there should still be room left for a 1-1.5” layer of sand below the brick. Screeding bars make for easy leveling of your bedding sand. You’ll want to place sand under the SRW bricks next. This is done to make placing the blocks easier. By having a thin layer of sand underneath, you’ll be able to adjust and level bricks easier and won’t have to worry about rocks getting in your way. At Hilgersom, we most often use screeding bars (1” square tubing) to help level our sand. The bars are placed on the gravel base and then adjusted to the proper height. Once the parallel bars are placed and set, you can add the sand. Pull a 2x4 (or equivalent) across the bars. 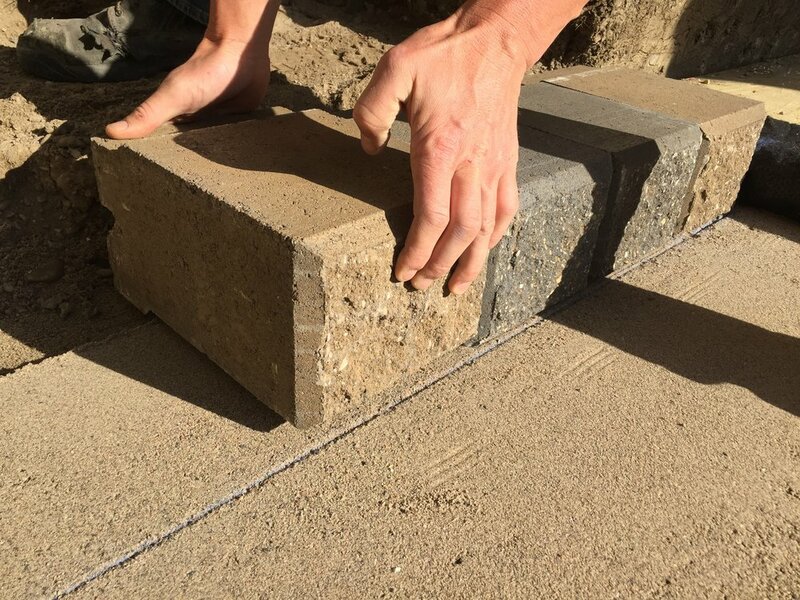 To ensure that the sand is a consistent density, pack the sand lightly either with your feet or hands, screeding it the first time, then repeating to create a perfectly level surface. Make sure to remove the screeding bars and trowel sand into the voids if they’re in the way of your wall. A guideline drawn in the sand will make for perfectly straight steps. Once the sand is leveled, you can start setting your SRW blocks in place. Before laying your first block, make a mark in the sand to indicate the front of your blocks. Doing this will keep the blocks as consistent as possible while you’re laying them. Keep in mind that different blocks have different locking mechanisms that may protrude under the block. To get around this, remove a bit of your screeded sand to allow for the bumps to be leveled easier later on. It's important to note that, when placing the blocks, do not slide them on your base sand. Instead, set them directly down, gently rubbing against the previous block each time. Take the time to adjust and level so your stairs are perfect! Once the entire course of blocks have been set down, some adjustments need to be made. Using a level and a rubber mallet, ensure that the blocks are laying consistently side-to-side, and level from front to back with no high or low spots in between. Don't forget to stagger the joints. Once the bottom course of blocks is leveled and in line with each other, you can start placing the caps on the blocks. Depending on the shape and length of your step, some caps may have to be cut using a diamond-blade saw. It’s always important to try and maintain a stagger with the blocks below (i.e. : the joints from the caps should not line up with the joints of the block below). Sweep the blocks so there's no debris in the way when you glue the caps on. When all the caps have been dry fit, remove them and ensure they stay in the proper order. Once the course of blocks below have been swept to remove any debris, place two or three generous beads of concrete adhesive on top. Be sure to stay at least a couple of inches away from the front of the block to prevent the glue from squeezing out and being visible. Place your caps back on top in the same order as you removed them. Ensure that the caps are in line with each other and stay off of them for at least an hour, depending on weather conditions. Backfill and prepare for the next course of steps. At this point, you can start preparing the base gravel behind to get ready for the next set of steps. It’s important that any voids between the back of the blocks of the step below be filled, especially when your steps are curved. This can be done by packing wet sand in between or by placing a geotextile fabric over the voids. Once any large gaps are filled, you can start backfilling with your base gravel. Hand tamp the gravel in thin layers to ensure good compaction. The height of gravel will be determined by the height of each step and the dimensions of the blocks you’re using. Be sure to leave enough room for another 1-1.5” layer of sand. Repeat as many times as necessary to create your steps! Start back at at the beginning for the next step and repeat for each following step! Of course, everything you need to install steps yourself is available at our landscape centre. Come by for all the supplies and advice you need!